I went down for a swim around 9am but didn’t get in. It was foggy, murky and there was no one in sight. 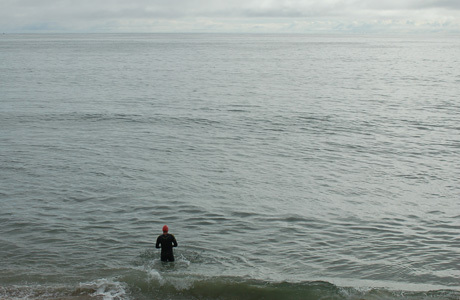 I walked down along the beach towards Temescal Canyon near to where a man was fishing. Just as I got near to him something large shot across the surface of the water for about thirty feet parallel to the shore, ten yards out. I could see that the fisherman had something big on his line and I asked what he thought he had. He said casually, “shark”. I knew right then and there it was one of the Whites we had been seeing this past week. So I waited and watched. The shark took the line out about fifty yards off shore and then it breached, twisting and turning completely out of the water flashing it’s white belly. The fisherman thought he had lost him at this point but the line went taught again and the fight resumed. After twenty minutes the fisherman brought the shark to the shore break. I told him that if it was a White he would have to release it. He gaffed it in it’s side (which I wished he wouldn’t have done) and hauled him onto the beach. A lifeguard, who was watching from his car, came down to get a closer look and we agreed that it was, unmistakeably, a juvenile Great White Shark about 5 – 6 ft in length. It had the signature snout and chin-like bottom jaw, a white belly and a ridge on either side of the tail behind the dorsal. Also, the gills were long. I felt as though I were in the presence of royalty, a prince, and that I should bow and be humble lest he decide to hold a grudge. The lifeguard called in to report the catch and also called several people trying to find someone with a camera. I couldn’t believe there wasn’t a single camera or camera phone within a mile! Not even a couple of tourists strolling by had one. No wonder these sharks seem so illusive. Another lifeguard came by and we agreed that the shark needed to be released back into the water because, we believed, it was on the endangered species list. The gaff wound didn’t seem to be too bad. There wasn’t any blood coming from it. So the fisherman cut the line and pushed the shark back into the surf. The shark flipped it’s tail and was gone. I hope it survives. I couldn’t help but feel that even though the shark’s eyes were vacant and black and that it showed us it’s gaping jaws several times, it still had a juvenile, neotenous look to it and it seemed kind of scared, helpless and cute of all things. I felt sorry for the little guy. I just hope it shares the same sentiment towards me should we ever meet again.